Fall is harvest time and it provides some of my absolute favorite foods. Mushrooms, apples, pears, and squash! Yum! I eat as much of these seasonal goodies as possible while they are around and then once they trickle out of season I wait for them with anticipation all year until they start to appear again at the market just as the long summer days fade away. It is like nature’s gift; as if saying to us not to mourn the loss of long, warm summer days but instead to enjoy the fall bounty. Squash is something I never tire of no matter how much of it I cook. I know lots of people think squash, especially pumpkin, is just for Halloween and Thanksgiving but I cook with it throughout the Fall and Winter. It is such a versatile ingredient that can be incorporated into both savory and sweet dishes. This weekend I bought a big piece of butternut squash at the Farmers' Market. We are lucky here in Italy because at the market you can buy a piece of the bigger squash instead of being obligated to buy the whole big squash. This last Saturday, it just so happened that when it was my turn to buy my vegetables just the neck of the squash was left and I excitedly claimed the whole thing as my own. I felt like I won the squash lottery – I got a bunch of beautiful flesh and I did not have to worry about scraping out seeds and the stringy part. I already used part of the squash to put together a quick, easy Sunday night dinner alongside truffle sausage (check out the Bella Buona Italia Facebook page for a photo) and today I decided to use another part in risotto. Now risotto and I have only recently become friends. In the past we had a very contentious relationship and I was never able to achieve the result I wanted when cooking risotto. 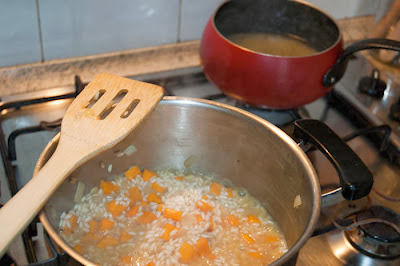 A month ago, our relationship really turned a corner when I did some researching a learned a few tips that changed making risotto from a somewhat nightmarish experience into an easy, no recipe required experience that consistently yields yummy, satisfying results. 1. Always start with a chopped onion or a few shallots. Saute on low heat with a swirl of olive oil in a pot until soft. 2. Add the rice and toast until it until the edges become transparent. 3. Turn up the heat and add a few glugs of white wine and stir the mixture until the wine has completely evaporated. 4. 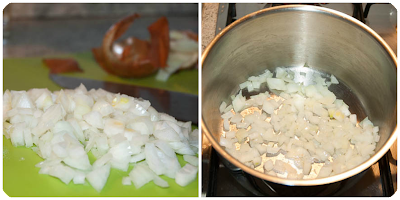 Add a ladle of warm broth and stir constantly (but gently) until the broth has evaporated. Continue adding ladles of broth and stirring until the rice is cooked (you decided when it is done – some people like it more al dente and others like it softer – you are the chef so you decide what you prefer). 5. Turn off the heat. Add a noce di burro (a walnut sized piece of butter as the Italians say) and some grated parmigiano cheese and then cover with a dish towel and let it rest for a few minutes before serving. That’s it! Those are the basic steps and once you learn them then you can start to play around and have some fun. Want to add squash? Go ahead. How about porcini mushrooms? That would be delicious! You can dream up any kind of risotto you think sounds good. Just use common sense when adding ingredients. 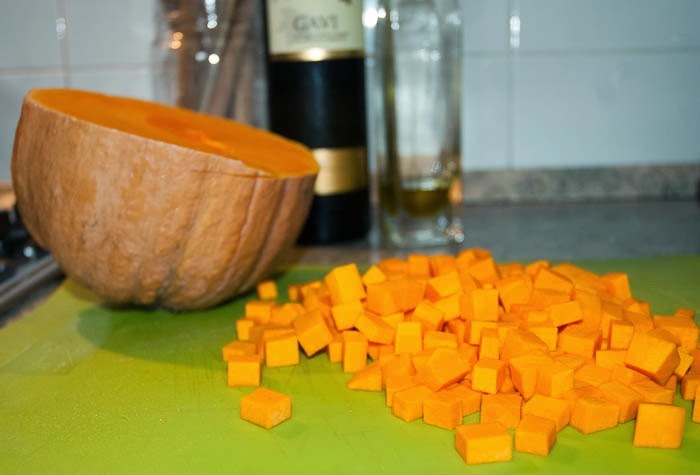 If it is an ingredient that is going to take a while to cook (like squash) add it after the wine. 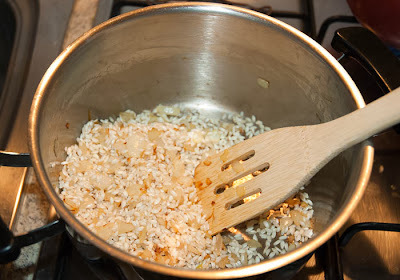 If it is a more delicate ingredient, then add it when the rice is almost done cooking. The beauty of learning the basic steps of a recipe like this one is that once you have it down then you can really take ownership over the recipe and you can make it your own. You will no longer be limited to other people’s ideas; instead, you become the chef and you can create your own unique dishes! Go play and let the seasonal ingredients available in your town inspire you to invent new dishes! If you have any questions about making risotto or any other Italian dish feel free to ask me. 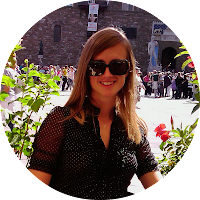 Leave a comment or write me an email.